I have been getting frustrated by the lack of search facility that Outlook has to offer. Specifically the lack of facility to search for a specific folder name – not an email but a Folder Name. I have lots of folders and sub folder so when I am looking for something its not always simple to find it, I want a facility that will find my folder. 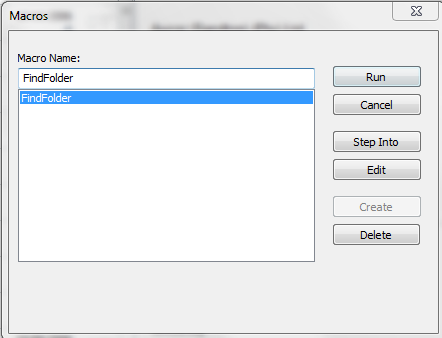 Simple click on Developer tab, click on Macros and then Macros again, select the FindmyFolder and click on Run ! You will then be asked if you would like to be taken to that folder. 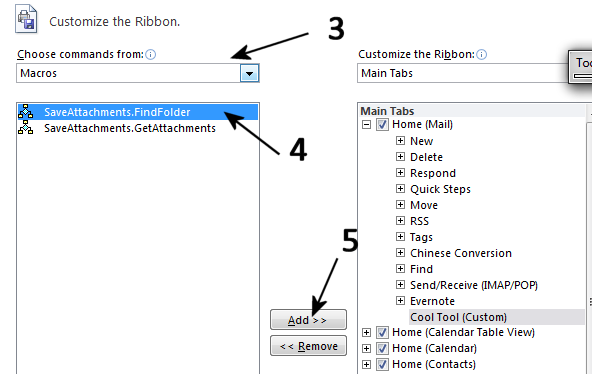 To make it even easier to access this without going to the Macro screen, you can use Outlook’s ribbon so its quick and easy. Then on the left hand side, click on the drop down till you find Macros, then Select the FindFolder, click on Add>> and it will add it to the Cool Tool that is highlighted on the right. This is a great tool. The wildcard capability is especially appreciated. Is there a way to adapt the code so that, if several folders fit the wildcard pattern, I could cycle through them to find the one I wanted and then have the code set that one as the active folder? In other words, if it found a match, and I answered “No, I don’t want to move to the found folder,” is there a way that the code could continue to search from there, find the next wildcard match and then ask me the same question again. Many thanks again for the tool and any advice you could give on my question. Gotta echo Joe here. Number 1 – of course, THANKS THANKS THANKS for writing this tool and making it publicly available. Number 2 (a distant number 2!) it would indeed be a lot more helpful if wildcard searches didn’t end at the first hit. I’m a cruddy programmer myself but I skimmed through your code and it looks like you have a subroutine that goes through all folders to look for a match – and when found you escape from the sub and present the result to the user. Could you present the result to the user while you are still inside the subroutine, and give the user three choices instead of the current two: (a) jump to this found folder, (b) keep looking or (c) quit. Or are there problems in Office Basic that make this more complicated? Any update with this code. 1st of all, thanks for the nice app. But also for me I need this “next” folder function to be able to use it the way I need. Hope you will find the time to update it. You needed it the techieguy made it! Great tool. Continue. great tool – saved me a ton of time. I am always losing folders. Also cut down scrolling through all my folders. Works like a charm. Nice one. It works smooth and provides with functionality you promised. TERRIFIC. THANKS! Amazing clarity in your instructions. Terrific. Thank you very much cool guy for this cool tool. It is very useful. Been a programmer for 30+ years (not PC stuff though). This is a great tool and thank you SO much! Would it be so difficult for the Microsoft people to spend a little less time on screwing up the user interface every release and a little MORE time giving us tools, like yours, that actually make things easier? Just wanted to thank you for building a macro to find outlook files! I have been asking for this solution for quite some time–really appreciate the time savings! 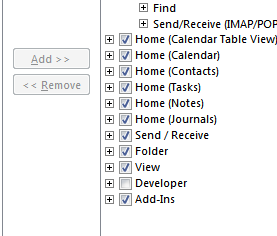 In Outlook 2010: Ctrl+Shift+F, Advanced tab, Field->All Mail Fields->In Folder. 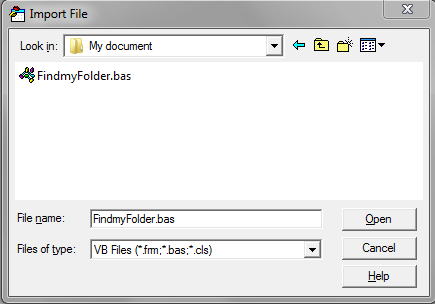 Enter your folder’s name in the Value field. Use the condition to simulate wildcards (or not). thanks for sharing – I find this method a bit long winded and doesnt work all the time. But its available for anyone who wants it ! Thanks- I am not even techie and it worked perfect. When I run the macro, Outlook hangs. After 3 minutes, I shut down Outlook and try again. Same issue. Most of my folders are in a separate .PST file. Does this create an issue? Thank you. I frequently inadvertently move my folders into other folders and sometimes don’t notice when that happens. This will save me lot’s of time trying to find them again! I have the same issue as Sprky: “When I run the macro, Outlook hangs. After 3 minutes, I shut down Outlook and try again. Same issue. Most of my folders are in a separate .PST file. Does this create an issue?”. Thank you for this tip, it works a treat. Why Microsoft don’t include a Folder Search option totally defeats me. Thank you thank you thank you – may good karma flow your way. Really helped me out – I loathe windows 8 & M/s Outlook 2013. I used to love Eudora but alas its gone. THIS IS BEAUTIFUL!!!!! You DA MAN!!! Why hasn’t MS done this already? Really excellent !! Good work!! Awesome. It worked like a champ. You should be the CEO/CFO of Microsoft as all of their dummies could not think of adding this feature in Outlook. Job Well Done. Adding my praise to the chorus of, “Thank You!” A life saver. Hi, I’m running Outlook 2013 now (and 2016 on another computer). I was looking at a macro that would allow me to get the folder of a mail after a search all mailboxes. I have a problem now with Outlook 2013 as the PST files are in the cloud. WOW…if only for one use…dang worth the effort importing this file! Hi, Will this work in Outlook 2013? Fantastic. The directions were perfectly written too. I know this is a very old post but this looks very useful so I attempted to follow the instructions but for some reason when saved the file on step 2, it doesn’t look like a zip file just a blank piece of paper – BAS file. I saved it to a file but when I went to import from Outlook the file was now showing. Am I doing something wrong. Any suggestions would be greatly appreciated. Jen, it sounds like you have already downloaded the ZIP file and something (either you or your browser) already extracted the contents of the ZIP file, which is a .BAS file. It should be FindmyFolder.bas. This is the file that you use in step 7 when configuring the macro in Outlook. 2) does this macro all you to “search” for a folder when moving / filing an email (i.e. – faster search & file like you can do on the Outlook app and web version of Outlook? OR…does this only allow you to search for a folder to access the emails within? Thanks for the great tool. I had it all installed and it was working perfectly. When I closed Outlook, it asked if I wanted to save, not sure what it asked I just said yes. Hopefully you can tell me what I am doing wrong. A great tool! This will save me so much time! Can”t understand why Outllok does not have something like this out of the box. Thank you!!!!! This is exactly what I need! I’m running Outlook 2013 in cached mode. Unfortunately my Outlook hangs with “Not Responding”. Any suggestions would be appreciated. After further testing, this works perfect when I type in the exact name of the folder I want to find. However, typing in a partial name results in Outlook hanging. Is there a way to resolve this? When I click on ‘Debug’ it highlights in yellow “LoopFolders F.Folders” near the end of the script. The network connection is fine – I can send and receive emails no issue.